These cones are placed inside the kiln during firing. a certain temperature is reached. Far left cone 05, melting temperature 1944 degrees F.
Far right , cone 10 melting point 2046 degrees F.
but, not too liquid as to flow off the pots. This preparation is for a gas firing. 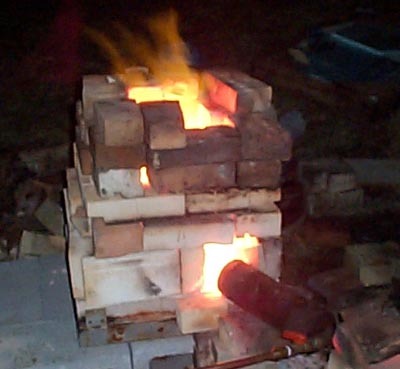 Loading the kiln properly is essential to a successfully fired load. The pieces must not touch each other. Pieces are placed on special high firing shelves and held up by shelf stilts. It is time to seal it shut by bricking up the front as illustrated above. and glazes flowing and cooking on his pots. There is literally a fire going on inside the kiln. 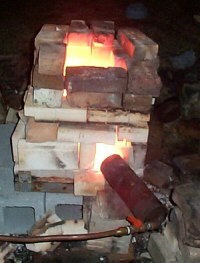 Small gas test kiln used in isolated firings studying clay bodies and glazes.